The suspension of Egyptian satirist Bassem Youssef's show "El-Bernameg" by privately-owned channel CBC has drawn widespread critcism from public figures, many expressing their concern regarding the future of Freedoms in Egypt. Minutes before millions were expecting El-Bernameg’s second episode of the third season on Friday, a statement was read by the host channel saying El-Bernameg would not air as expected, claiming Youssef and his producer had "violated what had been agreed upon" with the channel, as well as CBC's "editorial policies." The statement added that the show will remain off air until editorial and commercial disputes with Youssef are resolved. “If only I were minister of information, I would have invited Bassem Youssef to host his show on state TV,” said Law professor and Head of Cairo University Gaber Nassar via Twitter on Friday night, adding that the suspension affirms that the relationship of businessmen to media outlets is an issue that needs to be revised. “He made it very clear that whatever ******** reason they had is redundant, as they aired "Hekayet Hayah" in Ramadan, which according to their 'code' should have been banned,” said Abdel-Hameed, referring to a TV series aired on CBC last August that drew criticism for containing foul language and sexual intimation, which many perceived as inappropriate for an Egyptian audience. “In the last part [of the banned episode] he said, if the government thinks I am a threat to national security, they should give me a call and I'll stop the show, adding that he didn’t think the country is that fragile,” added Abdel-Hameed. The dispute began following Youssef’s first episode, which came after an almost three month hiatus, stirring controversy after the popular satirist poked fun at supporters of the General Commander of the Armed Forces Abdel-Fatah El-Sisi, whose popularity soared after the ouster of Mohamed Morsi on 3 July. According to Egyptian filmmaker Amr Salama, the suspension of El-Bernameg has exposed a lot. “Now the January 25 revolution and its gains are officially being fought; just as they were abused by the Muslim Brotherhood, now they are being usurped by those whose interests they conflict,” added Salama on his Twitter account. Others have hinted that the decision behind the ban could have been influenced by the authorities. Meanwhile, Presidential Spokesman Ahmed El-Muslimany asserted that the presidency respects freedom of opinion and speech, and that any decision to ban the show is “an internal matter,” that is up to the channel. “As long as there is no court ruling for its suspension … no one should accept the ban because they disagree with El-Bernameg’s content,” Khaled Talima, assistant minister of Youth and TV anchor said on his official Facebook page. “Freedom of expression is the mother of all freedoms; if it is limited to those we agree with, then it is a hollow slogan. Courage is in supporting [Freedom of expression] and not in oppressing it. A salute of appreciation to Bassem Youssef,” said Nobel laureate and former vice-president Mohamed ElBaradei. Founding member of the grassroots campaign Tamarod that led to Morsi’s ouster, Mahmoud Badr, added his voice in opposition to the banning of the show on his Twitter accounts. “If you ban Bassem from TV, how will you ban him from YouTube… How will you ban him from the streets and us from watching him?” said Badr. The voices of discontent did not stop at criticising CBC's decision to ban the episode. A call on social networks calling for the boycotting of the channel has gone viral. Meanwhile, the ban was viewed as legitimate by others, including the Chairman of CBC’s board of directors, Mohamed Al-Amin, who told Al-Ahram's Arabic news website on Friday night that Youssef did not respect a statement issued last Saturday by the satellite channel following his first episode aired on 25 October. “The decision taken by the channel to suspend El-Bernameg is in accordance with the media code of ethics,” explained Al-Amin. This is not the first time CBC has suspended Youssef's show. In 2012, the channel banned the first season's second episode, during which Youssef mocked famous CBC presenters, as well as then-president Mohamed Morsi. Youssef later uploaded the banned episode from the first season to YouTube, but took it down after three hours, due to a contractural agreement with CBC not to upload episodes unless first approved by the station, according to a production member at El-Bernameg. However, at this point, the show had been shared by others. There have been no official statements yet from Youssef or any of his crew regarding the suspension of the recent show and the episode has not been uploaded online. Sociology professor at the American University in Cairo, Iman Bastawisi, told Al-Ahram that she sees no restriction on Freedoms in the decision to stop El-Bernameg. “The channel has the right to protect its editorial policies … There are limits to preserve society, its principles, morals and symbols,” said Bastawisi, who expressed her discontent concerning sexual intimations used in Youssef’s show. Business Tycoon Naguib Sawiris and former owner of ONTV channel, where Youssef hosted the first season of his show before signing with CBC, has criticised the attention Youssef’s suspended episode is garnering. 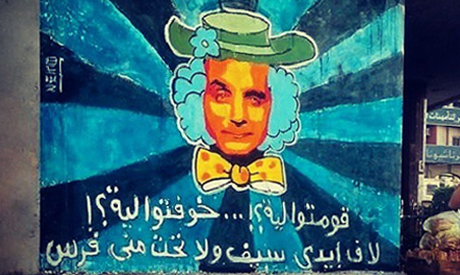 “What is more important, Morsi’s trial or the suspension of Bassem Youssef's episode? - or how we rebuild Egypt and get rid of poverty and become a strong, independent nation?” asked Sawiras via Twitter. They won't allow any one to speak against them, This is true Nazism. I would like to live under the Islamist MB rule instead of these secular Nazis. Anyone, group or idea, that suppresses ridicule shows its fear of people seeing its weaknesses and knows that it is too weak to survive unless it suppresses thought. There can be no freedom of speech under fascism. But horribly daingerous when you have a terorist organization in your country with its sole mission is violance. Stone age mentality of "My way or I will kill you mentality". Hard to offer freedom to this ilk and keep its civilized citizens safe. Remember the US has Guantanamo and all identified terorrist are incarcerated there WITH NO TRIAL.... ANYONE QUESTIONING THAT???? NO !!! Things are now gradually getting clear now.Actual aims of the regime now revealing.Army & old regime are taking control again what they had lost in 25th Jan 2011.Its an eye opener, those who supported 30th June revolution thought that Army is at their side against MB & Morsy now must wake up now.After knocking down the islamist,this regime is now taking revenge now from the civil socitey.Recent leaks of the CC on control media is a proof that Army is not willing to accept the goals of 25th Jan revolution. This sort of thinking is exactly that is intended to infect the minds of people - they want to divide the strongest front, those who are for June 30th and pro Military - do not for one day believe the old times are coming back, they can't . They would have to first kill Millions. Just watch and see how the CBC and Bassem Yousef thing will be handled, and very soon. Then you see for yourself that yet another attempt has been foiled. Instead, those who meddle to play with people's minds will be left exposed. Baseem Yousef is one of the few public figures who still remembers the goals of the 25 Jan Revolution, which are not the goals of this regime and any reference to it is cosmetic only! It is so obvious we are going back to the Mubarak days and perhaps further! Of course CBC want to stay in the pocket of the new regime and all of the benefits it may bring, they do not give a fig for freedom of speech unless it coincides with the views of the regime that supports them, they were not supported by the MBs, so they allowed any form of criticism of his regime, and I am not an MB supporter and, whether I agree with Baseem or not is not the point, but I stand by his right to speak, as I supported and will never forget the goals of the 25 Jan rev which included 'Freedom' ....! Remember! That under Morsi in 2012 a show was not aired because it made extensive fun of the President AND CBC. Again this show was making fun of CBC and the media extensively that's why it "violated policy" of CBC! The attempt to cause a division amongst people who supported June 30th has been ongoing, what better way to divide the masses and conquer yet again? The MB benefits greatly from this just shortly before the trial. Timing is everything, right? I refuse to believe a Military Strategist who outflanked everyone and the competent interim Government would undo all their efforts by banning a guy who just makes some jokes and anger 100's of thousands during this crucial period. A bit of logial thinking is required. Divide&Conquer in play, don't play into their hands! "Freedoms in Egypt questioned after El-Bernameg's suspension" I find the headline misleading. If CBC decides to put Bassem Youssef off air, its their own private decision. Your headline gives already the impression the government were behind. This is CBC's very own, very unwise and very ridiculous descision.- I personally wonder what they expected? BY has an important function and I find it amazing that CBC is not strong enough to sit our some mockery, even if it comes with questionable lingo :) Something else: since when is the "media code of ethics" implemented?? I've been waiting for this to be realized all along; however I absolutely don't think its applicable to the Bassem Youssef Show.. If you get that impression it's probably because it's true! yes, CBC made the decision and yes, the military ostensibly has nothing to do with it.. but in fact, the military has grown smarter than in 2011 to come to the frontlines and are only pulling strings from the backstage.. So ultimately, frankly speaking, we can't say the military did NOT have a hand in the suspension of El-Bernameg, even indirectly. The owner of CBC is and ex-NDP and a military cohort, he could've done it on his own. Many other businessmen in control of the media could well follow suit, out of fear of the military and the potential coming president, namely El-Sisi..